Darien, Conn. – The ninth annual Darien Collectors’ Car Show rolls into Tilley Pond Park at West and Lakeside Avenues, Darien, Connecticut, on Sunday, June 15, 2014, 11am – 2pm. Spectacular vintage, modern and high-performance automobiles will be the stars of this perennially popular show. The rain date is Sunday, June 22. This community gathering attracts 2,000 visitors to share camaraderie and view the more than 120 historically significant show cars from Darien and surrounding towns. 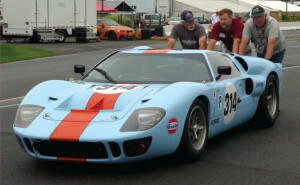 Last year’s People’s Choice award went to Michael Silverstein’s 1966 Ford GT40 Mk2A endurance racing car built under license from Carroll Shelby. This year’s lineup promises beauty and speed with a 1954 Mercedes-Benz 300SL Roadster, a 1958 Jaguar XK150 Convertible, a 1960 Austin-Healey Mark I Sprite, a factory-spec 1965 VW Sedan, five Lincoln Continentals spanning 20 years and three 1960s Cadillacs, among other highlights. The Darien Collectors’ Car Show benefits At Home In Darien, helping Darien seniors live in their own homes and community as long as possible. www.aginginplacegallivant.org. Sponsors for the show include BMW of Darien / Callari Auto Group.